Make tonight a movie night with your family! 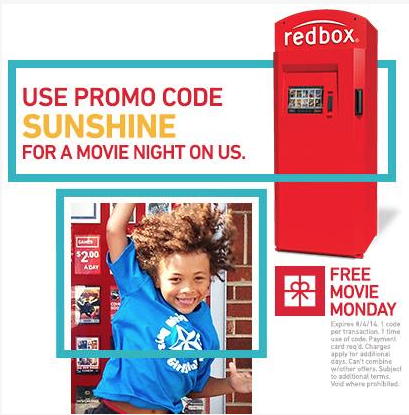 TODAY ONLY, 8/4/14, Redbox is offering up a FREE 1-day Blu-Ray or DVD rental when you enter the promo code SUNSHINE at Redbox.com, on the Redbox Mobile app, and possibly your local Redbox kiosk. You will also receive a $1.50 credit that you can apply towards a video game rental later. For more details, go to the Redbox Facebook page. « Three Months of Online Math Lessons for Pre-K Thru 5th Grade = Only $9!